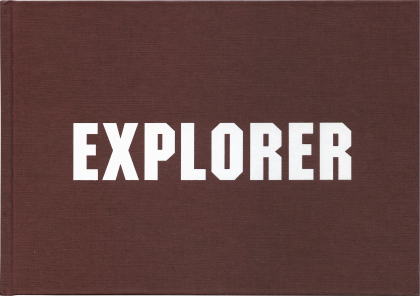 Explorer is a log book published retrospectively for Rita McBride’s 2018 solo exhibition of the same title at WIELS, Brussels. 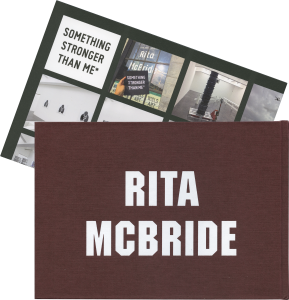 The publication includes a meticulous photographic record of McBride’s large-scale installation Guide Rails, which was specially produced for the WIELS exhibition, as well as an essay by its curator, Zoë Gray. Part of Guide Rails functioned as a matrix in and around which Something Stronger Than Me* – a programme initiated by McBride and artist Willem Oorebeek and curated by Devrim Bayar — took place. It comprised more than 20 contributions by artists and collectives, ranging from videos to workshops, sculptures to radio platforms, performances to migrating materials, with, among others: Extension, Fake Calligraphy, Melissa Gordon, Tonio Kröner, Ghislaine Leung, lonelyfingers, Lucia Nimcova, NUANS, Christophe de Rohan Chabot, Lázara Rosell Albear, Jannis Schroeder, Sparta, Axelle Stiefel, Monika Stricker, Suse Weber… The complete programme of Something Stronger Than Me* is chronicled in an A3 insert in the book. 220 × 150 mm, 48 pp.